Handmade rugs have enjoyed a long history that, according to many experts, spans thousands of years and across countless cultures around the world. In a sense, these rugs have threaded their way through much of mankind’s history, coming together into a stunning tapestry of the evolving beliefs, stories and challenges of us as a people. Yet, from the earliest handmade textiles of Peru to the ancient floor coverings of Persian nomads, some facts about handmade rugs have not only stood out, but also stood against the test of time –and enlightened those that consider themselves rug enthusiasts. Here are just a few facts about handmade rugs that we found the most interesting. In an essay on interior decorating in 1840, the American author Edgar Allan Poe said about handmade rugs, “A carpet is the soul of the apartment.” For a writer who wrote such works as “The Tell-Tale Heart” and “The Raven”, the exposition couldn’t have been more unusual – yet it likely inspired such modern-day film icons as The Dude from the movie “The Big Lebowski”. Unless you’ve been in the rug business for some time, few know the distinct difference between a rug and a carpet. However, while some areas of the world might disagree, the American floor covering industry has designated any carpet larger than 40 sq. ft. (or roughly 6’ x 9’) as a carpet, with anything smaller than these dimensions receiving a rug classification. In antique handmade rugs, it wasn’t unusual for camel hair to be used extensively throughout the weaving process. This has changed in recent times, however, due to the unpleasant smell camel hair gives off when it’s exposed to warm and moist environments, which has made it far more scarce in the production of modern Oriental, Persian and Turkish rugs. In 2013, the collective jaws of rug lovers around the world dropped at the news of a carpet being sold at auction for $33.8 million dollars. Owned and stored away for decades by the Corcoran Gallery of Art, the Clark Sickle-Leaf Carpet (a 17th century Kerman carpet measuring 8’ x 6’) was expected to rake in about $15M at Sotheby’s auction, but surprised everyone by more than doubling the high estimate – and blew away the previous record holder, which had been sold for $9.6 million in 2010. Depending on a rug’s knot count, the intricacy of its design, and the number of weavers involved in its production, a quality handmade rug can take artist(s) anywhere from a few months to several years to complete. Machine-made rugs, on the other hand, are usually assembled in a matter of hours, making them far less valuable and sought after by collectors. 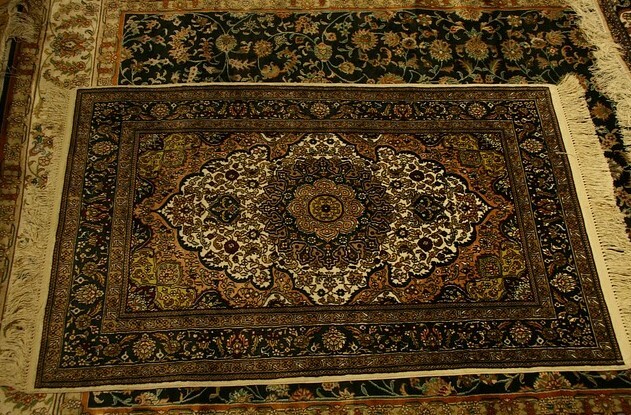 Just a decade ago in 2007, the Iran Carpet Company set up an extraordinary feat by commissioning 9 groups of weavers to produce the largest carpet in the world. Measuring over 60,000 sq. ft. in total – or larger than a professional football field, including the end zones – the carpet was assembled in 9 separate pieces before it was installed in the Abu Dhabi mosque. What’s even more interesting about this enormous piece? While it was being assembled, pieces had to be removed in order for it to fit, which totaled another 4,000+ sq. ft.
Ahdoot is pleased to offer a wide range of services beyond rug curation and sales, including rug cleaning, rug appraisal and rug repair. You can also explore our long history as rug specialists in NYC by visiting here, or contact us directly by visiting our store or by phone.